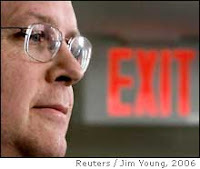 The great puppetmaster Karl Rove is set to resign by the end of this month. While I should be celebrating, the more cynical side of me thinks something is not quite right. Why now, suddenly in the middle of the last term of his puppet, does he "need to spend more time with his family"? This smacks of a cover, and a lazy excuse. There is something that is either about to go down, or was going to happen and now, with Rove out of the picture, will become moot. I can only begin to imagine what that may be. This administration has gotten away with a ton of offenses, many of them, I have no doubt, masterminded by one Karl Rove. They have successfully instilled a few into Americans that runs so deep, every event (even natural disasters) seems to be looked at as terrorism, every Middle Eastern person a terrorist. The fear has no limits - people in the most podunk town think they're next. It is brilliant marketing by Rove and his minions, who have actually, in a way, helped the terrorists do their job - make people terrified. That they have been able to do all this, and are above reproach, really makes me terrified of the future of this country that I hold so dear. So what's next for Rove? I don't buy this family thing. Will he go on to run the campaigns, albeit very behind the scenes, of one of the Republican candidates? Will he continue to pull the strings of the current administrations, but without the official rights to do so? Will he go hang out with his pal Scooter, and thank him for being a scapegoat? But, most importantly, will he leave the American people alone? This, I doubt. Sorry i didn't know where to tag anyway, very interesting site:) care to ex links>? Get it on Rove! Help the republicans win it in 2008.